Anpan was first made in Japan in 1875, during the Meiji period. At that time, many samurai had lost their jobs and were looking for new occupations. Japan was becoming more Westernized, and former samurai were often given new, unfamiliar jobs. One such samurai was a man named Yasubei Kimura, who became a baker. Of course, the staple food in Japan is rice; up until that time, no one had even heard of bread, let alone tried to make it. He watched foreigner in Yokohama baking bread and tried it himself, but failed. After more than a year of trial and error, he had the idea to combine “anko” (red bean paste) with the dough to make a distinctively Japanese bread. A little while later, the emperor of Japan himself became a fan of anpan. This made anpan popular all over Japan. Yasubei’s original bakery, called Kimuraya, can still be found in the Ginza district of Tokyo. Today anpan is one of the most common and beloved breads in Japan. It is a particularly nourishing and healthy snack for children, and there is even a popular cartoon character called “Anpan Man.” In addition to fighting for justice, Anpan Man has the power to feed hungry children by giving them bites of his head, which is of course made of anpan. Echigo Farm anpan is sweet (but not "super sweet") and filling, making them a ideal brunch food or afternoon snack for children. Anpan is very healthy, providing a balance of carbohydrates, protein, and fiber. 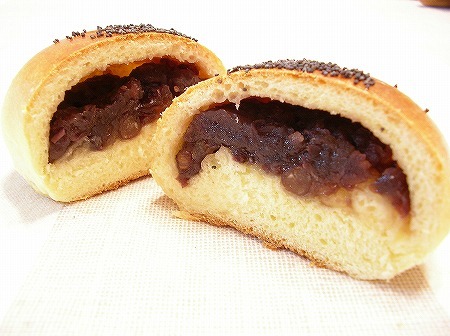 What makes anpan special is the adzuki bean. Adzuki beans are a good source of magnesium, potassium, iron, zinc copper, manganese and B vitamins. As a high-potassium, low-sodium food they can help reduce blood pressure and act as a natural diuretic. When combined with grains, beans supply high quality protein, which provides a healthy alternative to meat or other animal protein. Like most beans, adzuki beans are rich in soluble fibre. This type of fibre provides bulk to the stool and binds to toxins and cholesterol aiding in their elimination from the body. At Echigo Farm, Kumiko makes the bean paste and bread dough completely from scratch. For the "anko" (bean paste), she starts with certified organic adzuki beans and simmers them together with sugar for nearly five hours, then chills the paste to firm it up. The next day, she makes a soft dough from non-GMO, all natural unbleached flour and wraps a little bean paste in each one by hand. A small sprinkling of sesame seeds on top, and into the oven they go. We hope that our anpan can be a healthy choice when you need a hearty snack or light breakfast. You can find Echigo Farm anpan every time we are at the Greater Springfield Farmers' Market.